Year-end targets in China can mean one of two things, great achievement or cruel punishment. For one company in Shandong province, those who don’t meet their yearly goals must crawl on the street in degrading fashion. 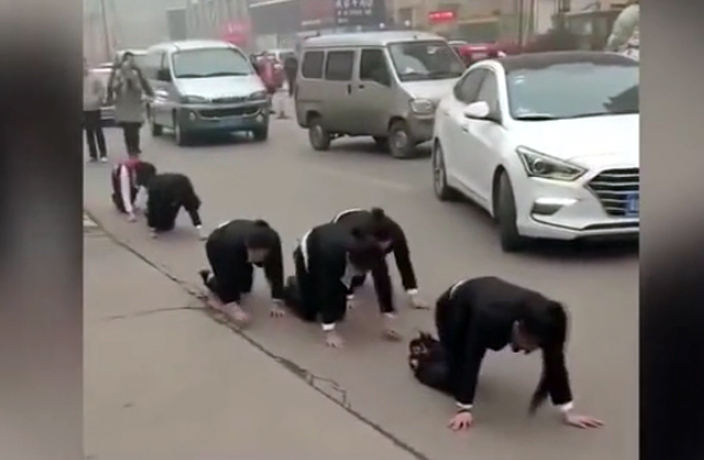 On January 14, multiple female workers from a trust company were forced to crawl on the side of a street in Tengzhou after reportedly failing to meet their year-end targets. In the video, several women can be seen crawling while others walk by and take videos of their humiliated colleagues. One man is seen walking and holding a bright red flag, leading the staff on their crawl of shame. The roads on which the humiliating punishment took place appear to be quite busy, with taxis, cars and bikes driving by frequently. According to reports, the police arrived quickly to put an end to the debacle and confronted the organizers about their behavior. Around this time of year, humiliating punishments handed out to underperforming employees are increasingly common as companies look to ‘inspire’ their staff for the upcoming year. If approved, it would clear the way for Xi Jinping to stay on for another term as Chinese President.